I challenged myself to design one fabric print a month this year. Since June is winding down, it was time to get to it. When I first started designing patterns I would sit with a blank page and start drawing. Since then I’ve changed my approach. Now when I’m designing, I go to my sketchbook and paintings and look for artwork I’ve already created that would work well as a repeating pattern. I’m in a summer frame of mind, so I selected this painting of goggles. Click here to read the details of the steps I take to create a pattern in Photoshop. I tried designing a pattern with the goggles before, but didn’t have success. This time, I had a new vision. I isolated the goggles, leaving only a little of the blue background and adjusted the colors to create the goggles in every color of the rainbow. I struggled a bit with how to get the design to repeat perfectly when the goggles were in a diagonal line. Sometimes I make things harder than they need to be. So, I revised the design to be a more organic placement and in doing so made it easier to create the repeat. I added a blue background color. I’m excited for the fabric swatch of this design to arrive! So far my “Swimming Laps” design is my most popular one. I recently reworked my Valentine squares to become a new “Pool Tile” design. The swatch of this design should be arriving any day. See all of my fabric print designs in my Spoonflower shop. Categories: Patterns/Surface Design | Tags: Designing fabric, Goggle fabric design, Goggles print pattern, pool tile fabric, print patterns, summer designs, summer fabrics, surface design, swimming fabric | Permalink. I enjoy designing fabric prints and love getting an email from Spoonflower that says someone ordered one. I’m excited to design some new fabrics with summer as inspiration. I have a few collaborations in the works, and am looking forward to seeing some of these fabrics put to use. If you sew, please contact me if you are interested in collaborating. All fabrics are available for sale at Spoonflower.com. Categories: Patterns/Surface Design | Tags: Calling sewing bloggers, fabric, fabric designs, quilt fabric, quilting, sewing, Sewing blog, sewing blogger, Sewing project, summer fabrics, surface design | Permalink. I’ve loved the pool since I was little. I swam on a swim team all year round as soon as I finished lessons, and continued all the way through high school. My mother was from the city and can’t swim well. When the family moved to the beach she decided all her children had to learn to swim. I’ve done the same with my kids. They pursue other things during the school year, but come summer they all swim for the local pool. This print pattern was created from swimmers and watercolor areas in my sketchbook, combined and overlapped in Photoshop. I’ve lamented before that I can’t sew, but I’m determined to make something with this fabric – maybe a drawstring bag or headband. I’ve been pinning patterns on my Pinterest board. I just need to find a friend who sews! Interested in making something with this fabric? Order it from Spoonflower. See my other print designs here. Categories: Patterns/Surface Design | Tags: fabric design, surface design, Swim fabric, swim team, Swim team design, Swim team fabric, swimming, Swimming print | Permalink. Recently looking through my sketchbook, I found a page of citrus fruits I painted, and thought it was a great start to a print design. I scanned the page, and played around with the elements in Photoshop, to come up with the above repeating pattern design. I’m loving the bright yellow, orange, and green colors! My Canson sketchbook is especially great for working in watercolor and ink because of the thick weight pages. And I love that the pages are bright white. Want to purchase this pattern, or see my other patterns, as fabric, gift wrap or wallpaper? Visit my Spoonflower shop here. I’m on a mission this year to design a pattern a month! See my past designs here. Want to learn how to create repeating patterns in Photoshop? Read this post. This post contains affiliate links to products I use and recommend. I earn a small commission whenever you buy using these links, at no additional cost to you. Thank you for supporting my blog! My new newsletter – is all the things that inspire me, and will hopefully inspire you! Don’t miss out! Sign up here so you don’t miss an issue. Categories: Patterns/Surface Design | Tags: best sketchbook, citrus fabric print, fabric print, How to create a pattern in Photoshop, lemons, limes, oranges, sketchbook, surface design | Permalink. My goal this year is to design a pattern a month. So as the month starts to wind down, I’m thinking about swimmers. Last month I created an ice cream truck pattern from illustrations in my sketchbook. It’s available for purchase on Spoonflower here. In January I designed a penguin polar bear pattern. Available here. See all my designs in my Spoonflower shop. Categories: Patterns/Surface Design, Sketch | Tags: Ice cream fabric, Ice cream pattern, Ice cream print, print patterns, surface design, swim, Swimmers, swimming, swimming illustration | Permalink. Nothing completes a day at the beach like a treat from the ice cream truck! I created this fabric print using illustrations from my sketchbook. Want to create a pattern from your illustrations? Follow the instructions below. Create a new file in Photoshop that is the size of your intended repeat size. Size the elements and arrange them mostly within this rectangle (the guides) – elements can go over the guidelines. Create another copy and place it below. Do you like the arrangement of all the elements now that the elements are repeating? (If elements go over the guidelines in your design, this is where you will see if things accidentally overlap, or are too close to one another.) If yes go to step 18. If no go to step 17. If not, delete all the groups except the original, adjust the position of the elements, and repeat the steps of copying the group and placing left and right and then making a group from the 3 groups and copying to place above and below. To save the final repeat, first go IMAGE, CANVAS SIZE and enter the original repeat size. Upload the final repeat file, and order a test fabric swatch. I use Spoonflower.com. Want to see another example of designing a repeat? Read this blog post. Another helpful post: Designing Patterns – important things to remember. Want to order the Ice Cream Truck pattern as fabric, wallpaper, gift wrap? Visit my Spoonflower shop here. 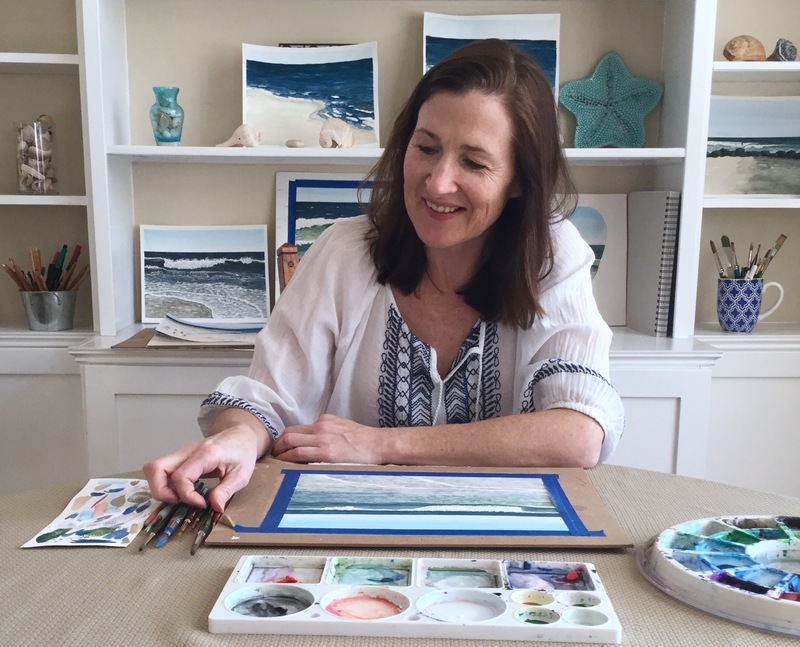 My newsletter is a collection of all the things that inspire me… “my creative collection.” It contains – artists and makers, places, crafts and art mediums, tutorials, podcasts, interesting articles, and more. All the things that inspire me, and will hopefully inspire you! Sign up here. Categories: Patterns/Surface Design | Tags: Artwork for spoonflower, Creating repeating patterns, Designing fabric prints, How to create a fabric print, print patterns, surface design | Permalink. At this point, you’ve probably put away your Christmas decorations. I apologize for being out of season, but I’ve designed a pattern with some of my Christmas countdown artwork, and am excited to share it. In 2016 I designed a handful of patterns, mostly using watercolors and hand drawn elements. I’m especially fond of the ink daisies overlaying the watercolor background. I plan on using this technique again. I think the most successful patterns were created after the fact – when I didn’t set out to design a pattern. I created the artwork, and then said, “I like that, I think I’ll use it in a pattern.” Time to look through my sketchbooks and paintings! 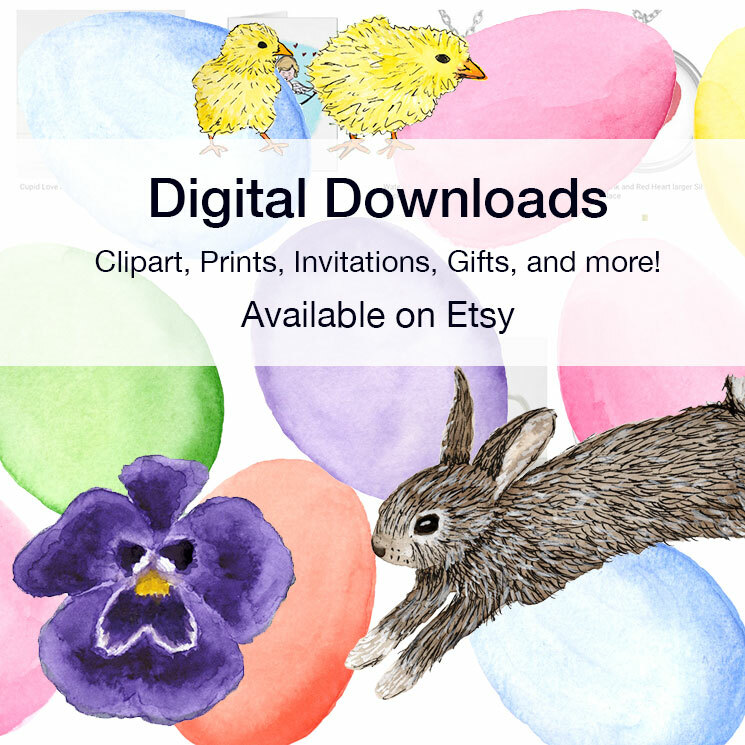 Many of my designs are available on Spoonflower as fabric, wallpaper, and gift wrap. Categories: Patterns/Surface Design | Tags: Christmas tree, designing repeating patterns, Mistletoe, pattern design, penguins, Polar bears, surface design | Permalink. The other day a swatch of my Christmas Elves pattern arrived. It’s so exciting to see my designs off the sketchbook page, off the computer screen, and printed. And even more exciting…last week someone ordered my gardening fabric. I wish I could see what they make with it! I’m so proud of my growing collection. See all my designs here. Categories: Patterns/Surface Design | Tags: Christmas gift wrap, designing patterns, patterns, repeating patterns, surface design | Permalink. As I sat down at the computer to design a pattern around my elf sketches, I quickly realized the sketches were just the tip of the iceberg. What kind of background did I want? A snowy scene? Or maybe a plaid background? When working with pens, paper, watercolor – basically any tools not on the computer – we have choices and options but once we move forward with a decision, things can only be changed so much. On the computer anything can be undone, changed, resized, rotated, colors altered, layers overlayed, etc. It’s a bit overwhelming! And I work as a graphic designer for a living. It must be the blending of the two – the hand drawn and the computer – that has my head swimming! I started with the elves from my sketchbook and added this snowy night background behind them. It was interesting, but the dark sky didn’t seem right for Christmas gift wrap. I tried the plaid background, but I didn’t like the computer drawn plaid behind the watercolor. But, I ordered a fabric swatch of the snowy night out of curiosity. Another day I went back to the sketchbook and drew Christmas elements, and eventually added watercolor to them. I also painted stripes in red and green. Back at the computer (on another day), I scanned and played around with the different elements. I liked using the watercolor stripes much better than the computer plaid. Although it was a challenge to get the stripes to look right when I repeated the pattern. I’ve order a swatch of this pattern, so I’ll keep you posted! I’m interested in your thoughts! Out of the 3 designs, which do you like the best? If you’d like to see my other gift wrap and fabric designs, please click here. Categories: Digital, Patterns/Surface Design, Watercolor | Tags: Christmas gift wrap, Christmas patterns, Christmas surface design, elves, elves gift wrap, Holiday gift wrap, north pole, north pole gift wrap, patterns, Spoonflower Christmas gift wrap, surface design, wrapping paper | Permalink.